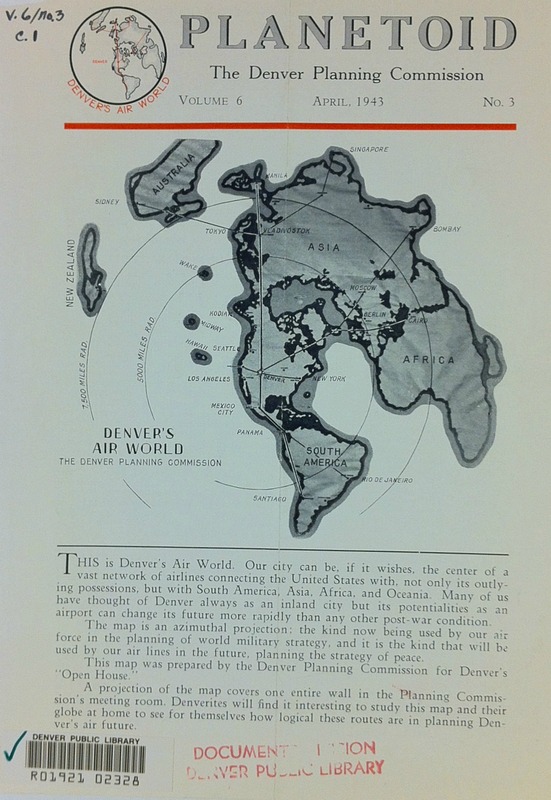 Thanks to Wendel Cox, senior manuscripts librarian at the Denver Public Library, for sending me this map issued by the Denver Planning Commission during World War Two. This unconventional world map centered on Denver was typical of a nationwide “air age” trend that used maps to explain new spatial relationships brought by aviation. I wrote about these new maps in my first book (final chapter), particularly those that were published to make sense of new strategies during the war. What’s fascinating here is how much the map evokes another, made a century earlier, by William Gilpin. You may recognize Gilpin as the first governor of the Colorado Territory in 1861, but before that he was one of the most zealous promoters of western development in the country. I’ve discussed his work in chapter 3 of Mapping the Nation, and in an upcoming article for the Western Historical Quarterly. Strikingly similar to the Denver air age map is his “Hydrographic Map” from 1848, reproduced online in chapter 3 here. Here is an adapted version that he published a few years later, but with the same message. 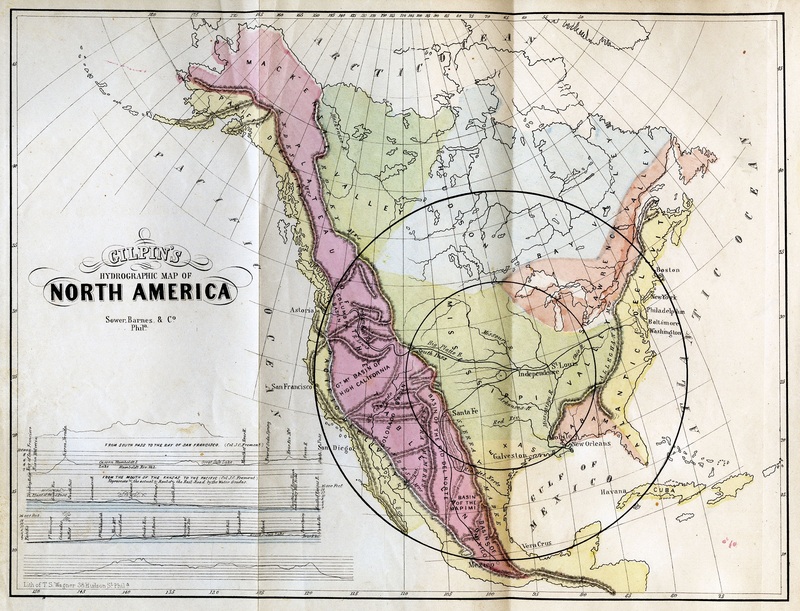 He positions the center slightly further to the east (in Missouri, where he was living), to argue that the interior of America – what others were then dismissing as the “Great American Desert” – was actually destined to be the breadbasket of the world, and geographically the center of a vast network of world trade centered on the United States. Gilpin even developed plans for “Centropolis” in what would come to be Kansas City. 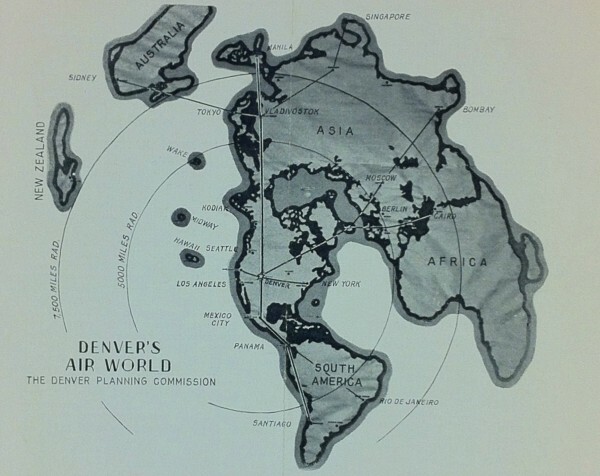 The Planetoid map makes essentially the same point, and was part of the major effort to expand Denver Municipal Airport to Stapleton Airfield in 1944. Gilpin would have been pleased.